The Indian Health Minister got informed on the progress of treatment, education, research and quality control of the Maharishi Ayurveda. 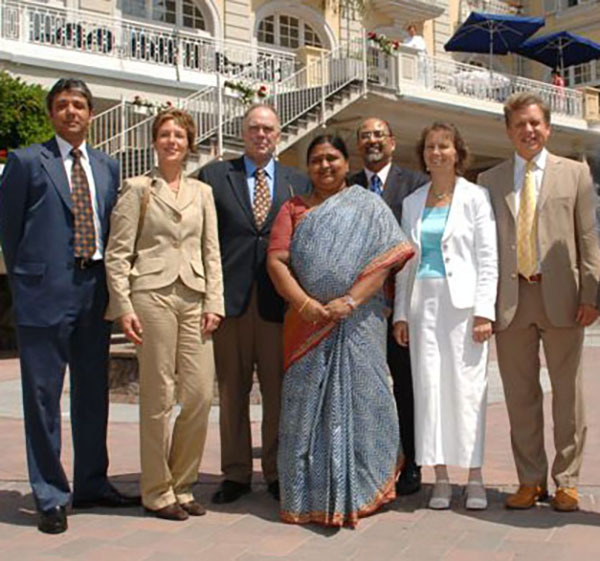 The Minister of State for the Ministry of Health of the Indian government, Panabaka Lakshmi, gathers information in Bad Ems about the development of Ayurveda in Germany. Last Wednesday the Maharishi Ayurveda Health Centre in Bad Ems welcomed a very special guest. As part of a tour throughout Germany, the Indian Minister of State for the Ministry of Health visited the Ayurveda Health Centre to gather information about the range and quality of Ayurveda in German Ayurveda facilities. Therapy, training, research and quality control were the main points of focus of the discussion in which the consul general of the Indian embassy in Frankfurt, Ashok Kumar, mayor of the city Bad Ems, Ottmar Canz, as well as Shantanu Banerji and Gudrun Buchzik of MTC-Maharishi Ayurveda Products participated. The highlight of the meeting was a tour through the 14,000 sq. ft clinic and treatment rooms during which the medical director, Dr. Karin Pirc, explained the range and process of the Ayurvedic treatments. The meeting continued at the Gartensaal (lecture hall) of the centre and in the following two hours studies and publications on Maharishi Ayurveda as well as the training guidelines of the German Association for Ayurveda (Deutsche Gesellschaft für Ayurveda – DGA) and the quality standards of the more than 800 certified Maharishi Ayurveda products were presented. The Minister of Health was especially impressed by the Maharishi Ayurveda studies on prevention of cardiovascular diseases. Financed by the American government, these research activities are the basis for a close cooperation between the Ayurveda Health Centre in Bad Ems and a specialized cardiological practice in the area. The Ayurveda health centre is currently arranging this cooperation. Dr. Karin Pirc is presenting additional studies on detoxification, rejuvenation and the reduction of environmental toxins in the physiology. She emphasizes that further scientific Ayurveda research is desirable. The scientific advisors, composed of several scientists of the German Association for Ayurveda (Deutsche Gesellschaft für Ayurveda – DGA) together with some of the most well-known Ayurveda experts of India, could serve as a link between the Indian and German research activities. For more than a decade, the DGA has trained German physicians to be Ayurveda doctors. This is partially directed by doctors and professors of Indian universities.